Come visit the acid fantasy mini-sandbox of the Misty Isles, a hellish pocket plane that’s brutally displaced a bucolic paradise. Marvel at its massive grub-ridges, shake at the body horror of its protein vats—and watch as your players dynamically unleash the Anti-Chaos Index through their own in-game actions. This is a 103 (digest) page sandbox/pointcrawl adventure on an island that bends towards the gonzo end of the spectrum. I tend to enjoy that sort of content, so, you need to be aware that I’m unusually inclined to like this. ANyway, about 60 pages have adventure contact/pointcrawl/complexes/wandering monster tables with the last forty pages being things like a bestiary, items descriptions, a kind of (lightweight) psionic system, and so on. There are four locations that quality as “dungeons”, or, rather, plces with lots of rooms to explore. It’s a pretty focused adventure, with a terser, but not terse, writing style that generally conveys a lot of information with a few words. The main adversary race is described as “Lawful Evil space elves with a taste for bizarre bureaucracy, biomancy, and (David) Bowie.” ANY idiot should be able to take that run. Which is exactly the level of aid an adventure resource should provide. This product is good, and reminds me that, for all the dreck, we truly live at a wonderful time for RPG material. It feels like a wonderful mashup of the Soulless from Mad Lands and Splugorth stuff from Rifts. Two great tastes that taste great together! It’s an island! Full of mist! 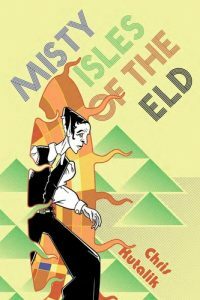 Once a fairy realm, the Eld have moved in, merging their plane with the island. Once ON the island it’s hard to get off again, thanks to the mists. On the island we find a great example of an alien environment taking over, with their brutalism architecture being imposed over the fairy-land. The party have a chance to correct that. As they explore and destroy/kill/get into trouble it’s likely that they will begin to push reality back towards the natural fantasy elements and away from the Eld-environment. This sort of real, positive feedback on the parties actions is not something a lot of adventures do but the parties I run seem to get a lot of … motivation? out of it. In general, letting the party see the consequences of their actions, in a real and tangible way, showing instead of telling, is a great way to reward the party in a non-traditional way. It’s laid out in a pointcrawl style, for the party to wander over the isles, with giant sandworm type things forming ridges to make it harder to go around. Several of the locations (four?) are expanded upon in detail, with 18-30 or so rooms per. The entire setting has this vibe that this both stark and baroque. It’s clearly a “Fantastic Environment” and taking a ship through the mists is a pretty classical way to declare You Are Somewhere Else Now And The Normal Rules Don’t Apply. The Eld, as an organized foe, have a variety of response levels to the parties incursions on their plans, with the response being pretty straightforwardly presented. More patrols. Locked doors. Calling for help, etc. It’s all to the point and makes sense for how an organized foe would respond … with the Eld personality twists thrown in. The NPC have great one-sentence summaries and then a few sentences more to expand upon them. This makes it easy to get their vibe, quickly, and improvise a great NPC interaction with them. Importantly, not everything is combat oriented and, even for those that are, their (terse) descriptions are focused on making that encounter memorable. It’s not just empty backstory garbage descriptions, but they are focused on the DM’s use of them. That’s EXACTLY what a NPC description should do, even if they are fodder for the parties swords. Monsters and magic are both non-standard. Not knowing what to expect with a new monster is part of the fear/fun of encountering new things. New items abound, with the psionic/biomancy vibe. Stuff to play with. Stuff to experiment with and get in to trouble with. Stuff to exploit. There’s no gimping the party in this. In fact, I think it’s a great example of how to provide an environment in which you don’t NEED to gimp the party. It’s relatively low level, which of course helps a lot. In fact, MOST adventure which gimp the party should really be for a much lower level party … and then you wouldn’t need to gimp them! Anyway, this is an excellent effort. Great environment, a lean towards the bio-gonzo, but not enough to turn off the people who hate Gamma World D&D adventures. A pretty decent terse writing style. Cause & effect for the party to witness along with a decent mix of encounter types beyond straight up combat. If you can tolerate the more gonzo-leaning product then this is a must buy. And even if you can’t stand gonzo I’d give one a try. Stylistically, it fills a nice niche between the originality of OD&D and wonkiness of gonzo. Also, I know I don’t mention art much. The art style here is nice and compliments the core conceit nicely: conveying easily the Lawful Evil Space Elves with a taste for bureaucracy, biomancy, and Bowie. Also, I don’t update reviews. Ever. Good to see you review a module I’ve had the chance to poke around in a bit as well – from the side of producing it, it was one of the more fun projects I’ve worked on and the Bowie elves were what sold me on it, too! Lol. My own blog posts have always been at war with Eurasia. As always thanks for the review. You might have an Easter Egg in the What Ho, Frog Demons. I neither confirm nor deny its existence.